There are currently 2 users and 1256 guests online. Hey guys, new to the forum and just thought this would be a great place to share one of my best catches- this Cobia. My partner and I went to Exmouth last Christmas and after a half an hour battle, and almost losing it after we didn't have anything big enough to get it in the boat, we managed to net the head and grab the tail to bring it in. I thought it was a tuna, then a shark.. (Obviously had never seen one before) and when my partner Rory got a look, swiftly told me not to lose it. Ha ha. good catch, they go hard and are great on the plate.. Thanks guys, it's a solid fish and really does give a good fight. Can't lie, it did go straight into flour and salt and pepper that night for dinner. That's my girlfriend! What a surprise seeing your face pop up on here? So Rozza, whats the secret to get the missus into fishing and not get bored after 20mins? I am, as I've said, merely competent. But in an age of incompetence, that makes me extraordinary. From memory I vaguely recall mine being fun to be around, then we got married and had kids. Now I enjoy the solitude fishing by myself.....lol. as said, great eating. Well done on the landing, net and tail. Great catch, keep it up ! Beau - getting her into it was the easy bit. The hard bit is getting her to ACTUALLY have one last cast. Let me guess - not married yet!! Nah not that bad really, but sometimes I'm glad my missus gets seasick as I enjoy some peace and quiet. But the catch 22 is if she fished I might get to go more often!! The trick is to annoy her until she tells me I should go!! They do look like little sharks in the water when you first get a glipse. The fun starts when they see the boat. They doggedly try to avoid capture by digging their head in. As for Rozza, Im with you. My other half IS a more determined fisho than me, and knows the deckie job backwards. It is always me that call lines up. So what more can you ask for. We never chat out fishing other than fishing stuff like fish on, get me that, get me this, good fight etc. If it starts quite we only say bite to alert the other there is some action. So we both get our solitude and enjoy nature and fishing - just love it. 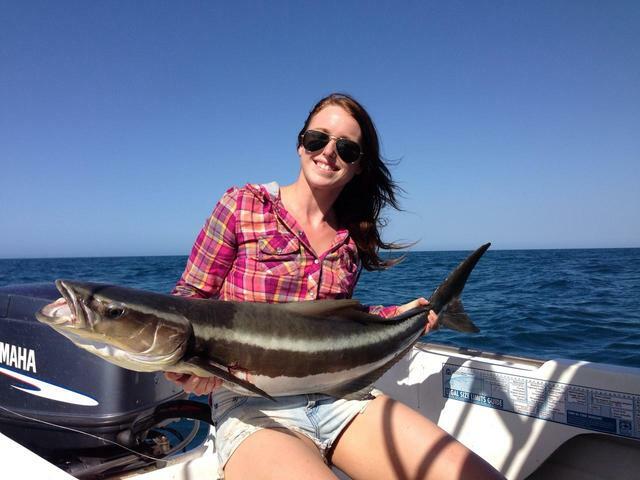 Well done Jess and welcome aboard, nothing better than catching a fish and cooking it up nice and fresh. I've spent half my life fishing.. The other half I have wasted..